Jeanne Paquin (1869-1936) was the first woman to gain international celebrity in the fashion business. Her design career spanned the three decades from 1891 to 1920. She was born Jeanne Marie Charlotte Beckers in l'Ile Saint-Denis, on the outskirts of Paris. As a young girl she was employed at a local dressmaker's shop and then became a seamstress at the distinguished Parisian firm of Maison Rouff. In February 1891 she married Isidore Rene Jacob dit Paquin (legally changed to Paquin in 1899), a former banker and businessman. One month before their marriage he founded the House of Paquin at 3, rue de la Paix, where for two years prior he was a partner in a couture business under the name of Paquin Lalanne et Cie. Creating a new business model, with Madame as head designer and her husband as business administrator, the couple built a couture business whose worldwide scope and stylistic influence were unparalleled during the early years of the twentieth century. Their innovative approaches to marketing and youthful yet sumptuous design aesthetic attracted fashionable women of the world who were poised for a new fashion image at the end of the Victorian era. The diverse and prestigious client list included famous actresses and courtesans, European royals, and the wives of American business tycoons such as Rockefeller, Astor, Vanderbilt, Ballantine, and Wannamaker. At its height the house employed more than two thousand workers, surpassing even the house of Worth. In 1907 Isidore Paquin died suddenly, leaving Jeanne Paquin to head their fashion empire alone. Her half brother, Henri Joire, and his wife, Suzanne, joined her as partners in 1911. She retired in 1920 and eleven years later married Jean-Baptiste Noulens, a French diplomat. The House of Paquin remained open under a series of designers, until it merged with Worth in 1954. Worth-Paquin closed in 1956. Astute and inventive in their approaches to doing business, the Paquins originated practices that later became standard operating procedures in the fashion world. Most sweeping was the concept of international expansion through opening foreign branches. In 1896 the house opened a full-scale branch in London, the first of its kind, where designs from the Paris house were produced in ateliers on the local premises. A branch in Buenos Aires and a fur establishment in New York followed in 1912, and a final branch opened in Madrid in 1914. The Paquins also took bold initiatives in the areas of client relations and marketing. From the very beginning, in contrast to the aloof approach of their contemporaries, the Paquins developed personal relationships with their clients that addressed their individual personalities and scheduling needs. Harnessing from the outset the power of glamour and entertainment to promote clothing, they sent beautiful young actresses to the opera and the races dressed in their newest models, several often wearing the same dress. Later, Madame introduced all-white ballet finales at her fashion shows, and in 1913 produced "dress parades" of dresses designed specifically for dancing the tango at the popular "Tango Teas" held on Monday afternoons at the palace in London. In 1914 she sent her entire spring collection on an American tour, which included New York, Philadelphia, Boston, Pittsburgh, and Chicago. The fashions were modeled by Paquin's own mannequins who astonished the public by wearing mauve and pink wigs on the street. Beautiful, chic, intelligent, and charismatic, Paquin was herself the best publicist for her own style. She always wore her own designs, and, widely admired by the public, was the first woman to become a fashion icon, establishing the precedent for Gabrielle Chanel. Equally acclaimed for her business skills, she received numerous awards and appointments, all firsts for a woman in her time. In 1900 her fellow couturiers selected her to head their first collective public display of couture at the great Paris Universal Exposition. She was awarded the Order of Leopold II of Belgium in 1910 and the prestigious Légion d'honneur in the field of commerce in 1913, and was elected president of the Chambre syndicale de la couture, the official organization of Parisian couturiers, in 1917. [Sometimes] … it is the material that inspires me. But I get inspiration everywhere. When I am travelling or walking in the street, when I see a sunset with beautiful blendings of colour, I often get an inspiration that helps me to evolve new combinations.… Our work in some respects resembles that of the painter. Jeanne Paquin in Designs and Publicite, 1913. The house offered a full range of garments that included fashions for all occasions-chic tailleurs (suits) for day wear; extravagant outerwear, especially evening wraps; and sporting clothes, which were sold in a special department opened in 1912 at the London branch. Opulent furs and fur-trimmed garments were always a specialty. Paquin clothes were renowned for their imaginative design, superb craftsmanship, and incomparable artistry. A brilliant artist and colorist, Paquin created breathtaking visual effects with color, light, texture, and tonal nuance that ranged from an ethereal luminescence in the filmy, pastel dresses fashionable from 1900 to 1910, to a bold vibrancy in the Oriental-inspired creations that followed. Extant examples of these clothes are some of the most stunning works of art in fabric ever created. Signature techniques to achieve these effects, especially in the earlier pieces, included layering, blending, and veiling filmy and textural materials of subtly varying hues; orchestrating the play of light on a garment's surface by juxtaposing trims and fabrics having differing light-reflective qualities, often outlining them with contrasting piping or chenille; and building up surface design motifs with dense encrustations of the smallest possible decorative elements, paying minute attention to size gradation and variation of placement. Endless varieties of gleaming paillettes, beads, and sequins; finely worked shirring and ruching box-pleated ribbon trim; padded appliqué; silk-wound beads; and spotted net were some of the favorite materials used to imbue the gowns with the uniquely Paquin visual quality. Other hallmarks were unorthodox combinations of materials, such as chiffon with serge in a tailored suit and strips of fur on a filmy, pastel evening gown. Always seeking novelty and individualism for her designs, Paquin frequently incorporated elements from other eras and cultures into her contemporary designs, as in a 1912 opera coat fashioned from fabric derived from the eighteenth century and draped like a Roman toga. Her signature accent color was a brilliant pink, and she was famous for her dramatic use of black, both as an accent and as a chic color in its own right. Neoclassicism was a favorite design motif. While her artistry in visual effects and composition was unsurpassed, Paquin also designed for function and comfort. Through her promotion of these principles, she was a significant force in moving fashion towards the modern style that took hold in the 1920s. She herself frequently wore a practical, ankle-length, blue serge suit for work. By 1905 she was already aggressively promoting the more natural and less restrictive empire line that established the context for Paul Poiret's radical versions of 1908. Between 1912 and 1920 she designed clothes for the active woman, such as a gown that combined tailoring with draping, so that it could appropriately be worn from day into evening, and a version of the hobble skirt that kept the narrow line but allowed for ease of movement with the invention of hidden pleats. 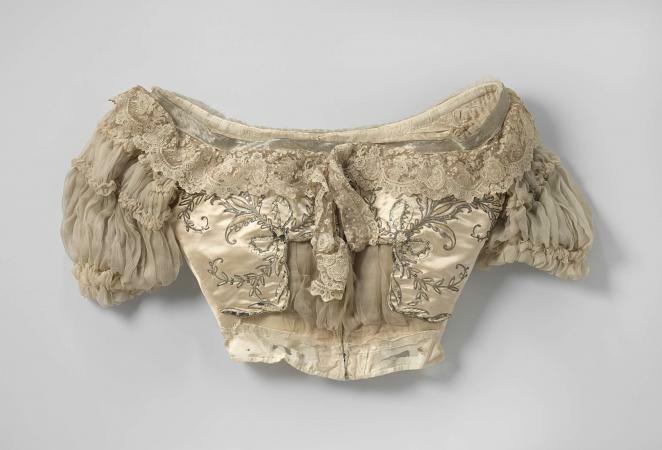 Paquin's contributions in the areas of business, public persona, art, and design firmly establish her place in fashion history as the first great woman couturier. See also Fashion Designer; Paris Fashion; Spangles; Charles Frederick Worth. Buxbaum, Gerda, ed. Icons of Fashion: The Twentieth Century. Munich, London, and New York: Prestel Verlag, 1999. McAlpin, W. L. "Mme. Paquin Honoured. A Famous Dressmaker and Her Methods." In Designs and Publicite. By Jeanne Paquin. Volume 336. Unpublished scrapbook, 1913. Reeder, Jan Glier. "The House of Paquin." Textile and Text 12 (1990): 10-18. --. "Historical and Cultural References in Clothes from the House of Paquin." Textile and Text 13 (1991): 15-22. Sirop, Dominique. Paquin. Paris: Adam Biro, 1989. Troy, Nancy J. Couture Culture: A Study in Modern Art and Fashion. Cambridge, Mass. : The MIT Press, 2003.